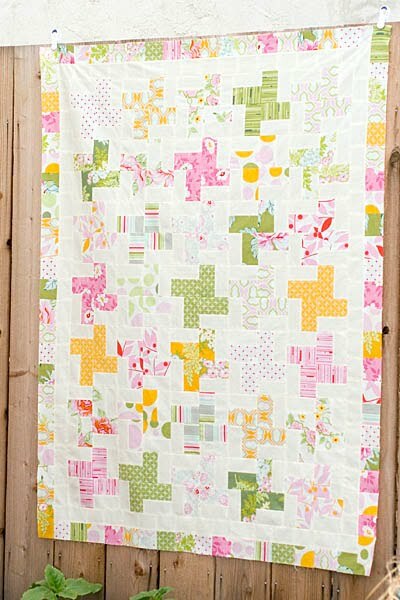 Even through the rain this quilt is bright an springy. May I introduce to you... Miss Nicey Jane. 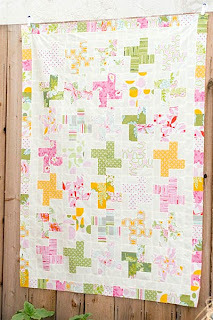 I was inspired by this quilt the same day my husband brought me home a stack of Nicey Jane. The next thing you know I was cutting and sewing up a storm. I loved the chunky windmill block with the bold prints. The colors put a smile on my face. The windmills came together very quickly. I pieced together long 2 1/2" strips and then cut them into pieces (blades). The border is made up of the leftovers. I've got stripes planned for the binding and a large floral for the back. Whirrrrrr..... here I go. Really, really, really nice! Love the little squares on the border. I might just have to copy. 2 1/2" or 2 1/4"